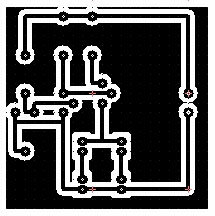 Circuit is too simple and uses only a few components. 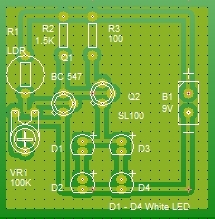 LDR (Light Dependent Resistor) is used as the light sensor. Its resistance is as high as 1 Meg Ohm in dark and reduces to 100 Ohms or less in light. 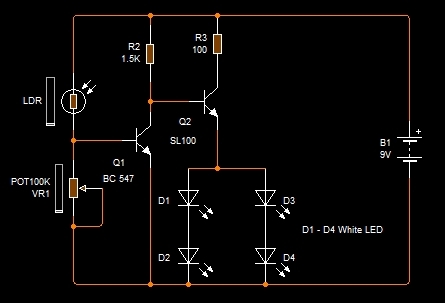 When there is sufficient light (day light or Electric light) in the room, LDR conducts giving base bias to Transistor Q1. It conducts and pulls the base of Q2 to ground. So Q2 remains off and White LEDs also remains off. When there is darkness in the room due to power failure, resistance of LDR increases and Q1 turns off. Q2 then conducts and White LEDs turn on. When the room light returns, White LEDs turns off.Adjust VR1 till LED turns off in the particular light level in the room. So when there is darkness above that set level, LEDs turn on.